Today’s post is not just cutting a watermelon, it’s about picking a good one, too. Because believe you me, nothing makes me more mad than paying $5 for a watermelon only to come home and have it be disgusting. I actually sweet-talked the nice lady at Albertson’s to take one back a few months ago when I broke one of the cardinal rules of watermelon-buying. Okay, okay, I didn’t really sweet-talk her into taking it back…something about Albertson’s policy to return your money if you’re not 100% satisfied. But I WILL say that it took guts for non-confrontational me to bring a dripping watermelon into Albertson’s and ask for my money back. So before you can cut your watermelon, you need to pick a good one. These tips won’t guarantee 100% that you’ll get a great watermelon, but it will greatly increase your chances. In fact, in my experience, as long as I follow all these rules, I’ve never gotten a bad one. 1. Make sure you’re buying the watermelon in season. In other words, buy it in the summer, from about May-September. This was the rule I broke at Albertson’s–I love watermelon so much that when I saw it for sale in March, I couldn’t control myself. And it felt like rubber in my mouth. 2. It should be heavy for its size. 3. It should sound hollow. Once you find your unusually-heavy melon, put it down and knock on it. If it sounds hollow, you probably have a winner. A hollow melon alone doesn’t mean it will be good, but one that’s hollow AND heavy is another story. 4. Examine the rind. You just want to make sure it’s not leaking, bruised, or soft anywhere. If not, you probably have a winner! A lot of people don’t buy watermelon, even if they love it, because they can’t quite figure out a good way to cut it and eat it. 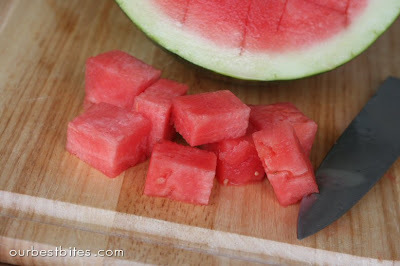 I think slices of watermelon are fun, but for overall simplicity, I like cutting it into chunks. And this is the easiest way to do it. 1. Wash the watermelon. I know that sounds weird, but watermelons grow on the ground and the rind is dirty. When you cut into it, all the yuckiness on the outside of the watermelon will make its way to the inside of your perfect watermelon. 3. Make vertical cuts about 1 1/2″ apart all the way down to the rind. 4. On one side, make horizontal cuts about 1 1/2″ apart. Repeat on the other side. Okay, Sara interjecting here. This is where I got lost the first time I tried this. For some reason I didn’t understand the knife angle, so in case anyone is like me and butchers the melon on the first attempt, notice the picture below. 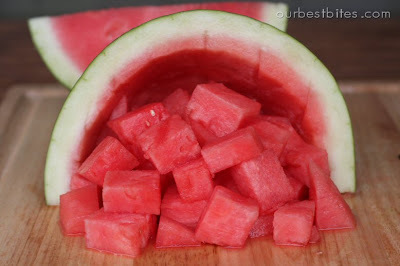 The cuts on each side of the watermelon should be at the angle shown. 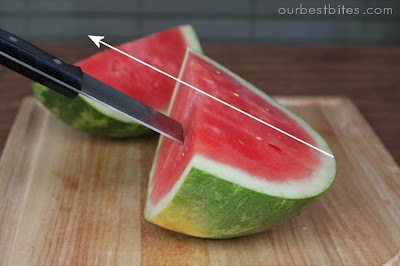 Notice the knife is parallel to the opposite side of melon (shown by the white arrow). Do this on both sides of the watermelon quarter. 5. When you do it correctly, you get perfect little cubes! Flip the wedge over and let all the cubes that have been completely cut fall into a large bowl. There will be some pieces remaining. 6. Run your knife along the inside of the rind to release any remaining cubes. Repeat steps for remaining wedges. There you have it- super quick and easy and you get uniform little cubes every time. Happy watermelon eating! Thanks I never knew how to pick a good one!! I will be on the hunt tommorrow!! Thanks! I needed this! I’m always so unsure and seem to end up getting the wrong one. So basicly I’ve stoped buying them! Have a blessed weekend! great advice…now if only Sara liked watermelon. Hey isn’t there some shortage of watermelon these days? SARA!!! You don’t like watermelon??? HOW?? My dad swears by looking for bee stings near where the stem would be. He says the bees only sting the sweetest ones. I swear by having the produce manager at Macey’s (a family friend) pick me one. It’s always guaranteed to be a good one! Neat trick! I cut mine very similar, but it never occurred to me to cube it BEFORE releasing it from the rind. I’ll have to do this. Alton Brown said on his show to look at the patch of the watermelon where it sat on the ground. If it’s yellow instead of white, then it’s “done”. Works about 95% of the time for me! Mmmmm I love ice cold watermelon in the summer! All of the tips reminded me of trips to the grocery store with my dad. In addition to being heavy and hollow, he always made sure we picked the one with the most sugar spots (the nasty looking brown crusties… haha) so we were sure to have a super sweet one! Yum, the pictures of juicy watermelon make me want some now! Those are great tips, and now I’m inspired to go find me a great watermelon. 🙂 And thanks for pointing out that it’s 7/11, I never knew they gave out free Slurpees today! Eric, I can’t believe you ratted me out! I was trying to keep that on the DL around here, lol. Ok, it’s true, I don’t eat watermelon. It’s weird because I *want* to love it, (kind of like I *want* to like seafood), it always looks so juicy and yummy, but when I do eat it, I get nauseous. Every time. Weird, huh? but it it’s any consolation, watermelon flavored bubble yum is like my favorite thing ever, lol. And…even though I don’t eat watermelon, I do have to cut it still, and I never knew that neat trick, so thanks Kate! The bee sting trick has always worked for me as well-the more the better! I was wondering the same thing Kate! how can you possibly see where a tiny bee stinger went in?? lol. Is it really the sugar spots, like Becca is talking about? I ALWAYS use this method for picking a watermelon and it hasn’t let me down yet! Sara, I like watermelon but I hate cantaloupe. I want to like it, just like you want to like watermelon but it just tastes so gross! Pyper, I heard about the watermelon study! Okay watermelon study girls…do tell! i see this was several years ago, but i would still like to know. anything i have to worry about today? LOL about the watermelon study. That’s slightly nauseating. And if it makes you feel better Sara I don’t like watermelon AT ALL!! But I love watermelon flavored things too. Weird huh? It’s as if you read my mind. I was just going to request some help in choosing good melons. You guys are so on top of everything! Wow! I’ll remember those tips for the rest of my life! Every. Single. Day. Sara–I’m not a huge fan of watermelon either, and I can’t figure out why! But I know I hate ANY seeds, so even the tiny white ones in the “seedless” watermelons get picked out by me. Mmm watermelon!! And I totally eat the seeds. I have searched the internet looking for the best way to cut a watermelon and this is by far the best that I have found. Me and my daughter loves watermelon and every time I cut it I always screw it up. So thankyou for this great "How to"!! I use the Alton Brown tip, too, about the yellow patch on the watermelon where it sits on the ground. It's worked for me many times! I love ice cold watermelon in the summer!!!! Choose one with scars that are leaking brown drips of sap-like stuff. That's the way to get a sweet one. This is my first time visiting… great food blog you seem to have created. I took a quick look for now. I especially eyed the turtle pretzels and your spicy honey chicken. Looks yummy! I love cutting watermelon this way…give me a few days and I can eat 1/2 of one, by myself! I loved your tips on how to find a good one…that was something I never knew. Also, the tip to wash your rind…grosses me out a bit to think I've never done that before! Blessings to you! Great post! I will pick up a watermelon for the weekend. Genius! We eat Watermelon ALL summer long, my 2 year old doesn't eat alot of anything but Watermelon is her thing, so I buy it about twice a week. 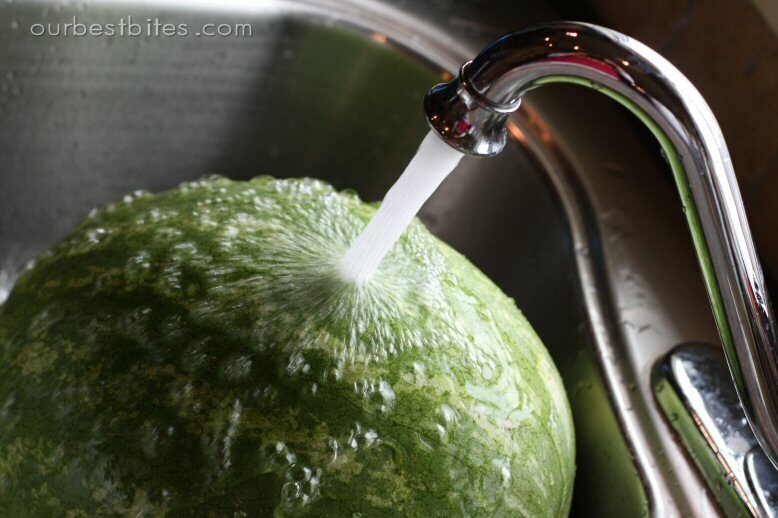 Great tip on cutting and washing the melon. I learned to look for the bee stings too. I've never had a bad one since I learned that trick! I needed this like 30 minutes ago. lol Thanks! I've been cutting it the hard way all my life. You guys ALWAYS make me laugh. I just read this "Simply run your fingers around the center of the watermelon, not lengthwise but around the center of the fruit between the stem end and the blossom end of the melon. An immature watermelon will be smooth to the touch, but as the fruits mature they will develop slight ridges that will be very noticeable as you run your fingers across the rind." Watermelons don't ripen after they are picked. Wow! You made that look so easy! Now I want to go out and buy a watermelon. 🙂 Thanks for this. I had an experience with pineapple the other day. I saw it on sale and I went to the market to buy one and as soon as I got there I was like, "I have no idea how to tell which one is a good one". Luckily the one I picked randomly was perfect! I then I had to look up how to cut it. haha! Another handy tip is to cut up the watermelon so that you have small wedges, but that each slice still has part of the rind attached. 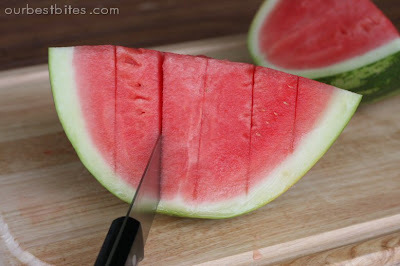 If you leave the rind attached, the watermelon will stay fresh for much longer without getting mushy. I don't know why it works, but I can cut up a watermelon and have it stay yummy and fresh for well over a week. Thanks for helping this Idaho girl become watermelon savvy! My boys all LOVE watermelon but it has always been hit & miss at picking a good one. And my watermelon cutting skills were also lacking. 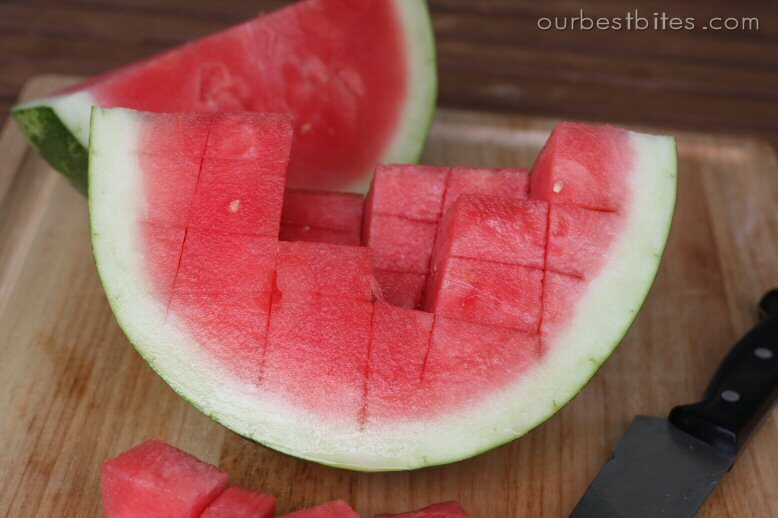 I always cube it but I would cut it into slices and then cube each slice. This will be much faster & give me more consistent sizes! Thanks again! I am a watermelon lover. I knew about sounding hollow, but I didn't know that the weight mattered. And as for cutting, I had no idea. I just butchered it to my hearts content! Thanks for the tips! Hurray for watermelon season! First of all, I absolutely love your site. It's soooo me!! I am the "kitchen guru" around work, church and friends and family and love new resources with such great ideas. So, I happened to notice that you have the HCG add at the top of your blog and wondered if you have ever tried them or it its paid advertising? I've heard so much about it, but want to hear it from a real testimonial, not a paid actress . . . Thanks for all your do! It works! LOL! we tried it yesterday and we got it home and it was so good! 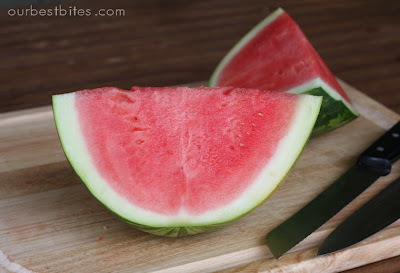 so when looking for a watermelon look for the double HH's is what my hubby said LOL! heavy hollow..it's in our heads forever now LOL!thank you so much! Meltardy- that is just a paid advertising slot. Neither Kate or I have actually tried that diet. I have wonderful recipe for watermelon mango salad if you want it. It has lime juice, honey, lime rind, diced mango and diced watermelon. It is the best salad ever!! Thanks for the picking and cutting tips. I would have never thought. I Love watermelon, so this will come in handy. I thought I had a great system down for cutting watermelon but I tried your lovely cutting directions the other day and it worked beautifully! The best part is little mess at the end with the juices getting all over the counter…everything just pops into a bowl without a mess. Thanks! Thank you so much for the tips on how to cut watermelon. I just chopped one up and it was easy and perfect! I had to cut up a watermelon for a BBQ this summer and when i told my husband that I was going to look on your website for how to cut it, he totally made fun of me and informed me that "you don't have to google EVERYTHING you do!". But after he saw the results and how easy it was, he was a believer! I have passed this on to other friends too. New to your website and am so excited to try some of these yummy recipes with my family. I was once told that when picking a watermelon you should look for the “bee stings” on the rind. They look like little dark hard beadlets of sugar. this means that the bees have tried to get at it for its yumminess. I have never gone wrong picking one! I used this method for cutting my watermelon today and it was WONDERFUL. My mom walked in as I was cutting and was very impressed. 🙂 It isn’t often my mom learns a cooking trick from me. Thank you so much!!! I was in charge of bringing watermelon for 80 people for a church activity today. Boy did this technique come in handy! Thank you so much! finally remembered to use this techinque and GENIUS. Takes no time and my cuts look so much prettier. can’t wait ’til I can show this off. My dad taught me that you should slap it and it should sound the same as when you slap your belly. I look like a weirdo when I pick watermelon as I slap my stomach then the watermelon until I find on I like. My brother added to that, that it should be green with a beige spot, that way you know it ripened on the vine. Now I’ll have to add the heavy for it’s size thing! So useful!!! I usually butcher my watermelon. But I was asked on Sunday to make a fruit tray for a funeral later on today and I wanted it to look nice. Thanks to your tips on how to cut watermelon, pineapple, and oranges, it looks beautiful! Thank you! Thank you! And it seems that my 2 year old will eat more watermelon when it’s in chunks rather than slices. That’s good to know. that’s how i cut a watermelon. i love that it’s less messy and quick. thanks for posting. Awesome! This is how my hubby showed me to cut mine! Im actually growing some little watermelons in my raised bed garden this year. I seriously just spent 1.5hrs cutting up two watermelons only to get on pinterest and find a link to this post. Man. Should’ve gotten on pinterest and THEN cut up the watermelon. I’m trying this next time thanks for the tips! Great tip for cubing the melon. One note: watermelons do NOT grow in the ground. They grow on a vine that flowers and each flower then produces the fruit. They lay on top of the ground. As a farmer’s wife I like to educate the public in regards to our food source. Isn’t this how everyone cuts watermelon? Another tip for selecting a watermelon is to look at the dirt spot. The dirt spot is the spot that is from the watermelon sitting on the ground and not getting sun exposure. It should be more toward the yellow hues than the white hues for a nice ripe one!